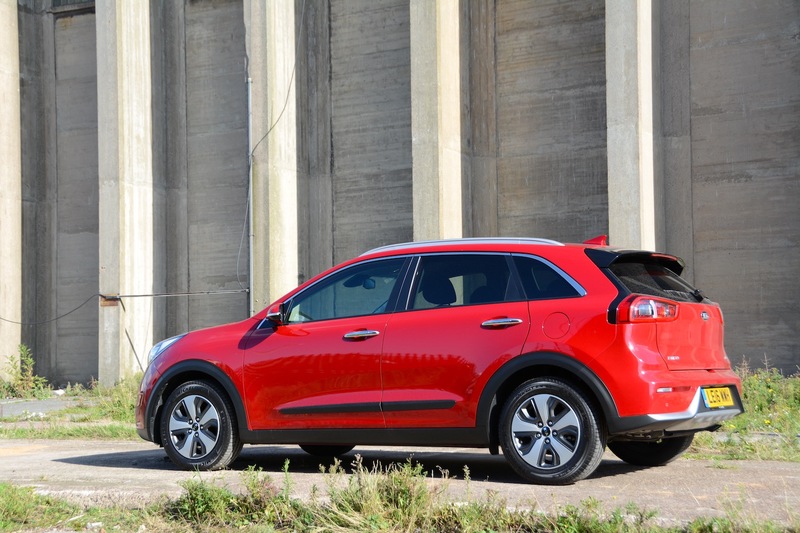 The Kia Niro has an efficient hybrid powertrain in a practical yet compact crossover-style body – all at a competitive price. 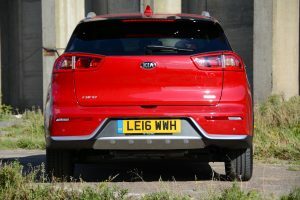 Kia is aiming to capitalise on the trend that everyone wants a crossover or an SUV, and that cars need to have lower emissions, and the Niro is the result. 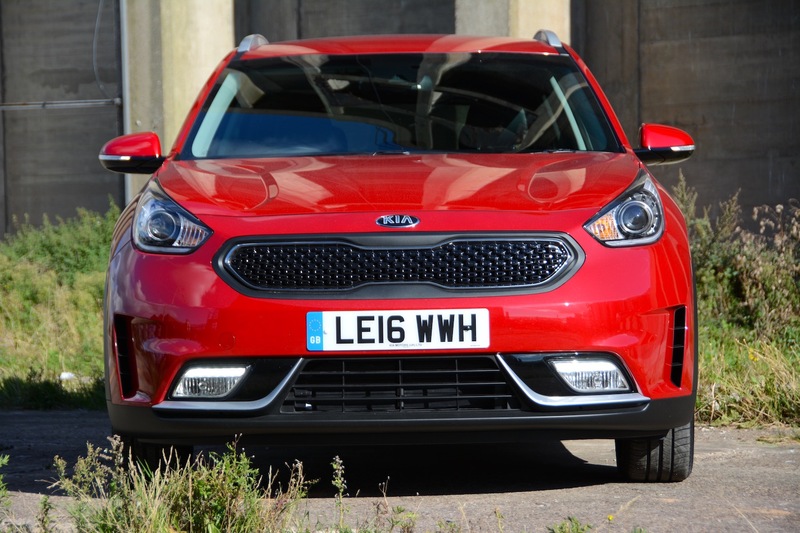 However unlike some other hybrid SUVs, the Niro is relatively small and light, so there’s hope that this car could be efficient in real-life driving. The Niro has a 1.6-litre, 4-cylinder petrol engine, along with a battery and electric motor – as per the concept behind the hybrid system in the Toyota Prius. However a key difference is that the Niro doesn’t have a CVT transmission like the Prius, but instead a 6-speed DCT transmission. 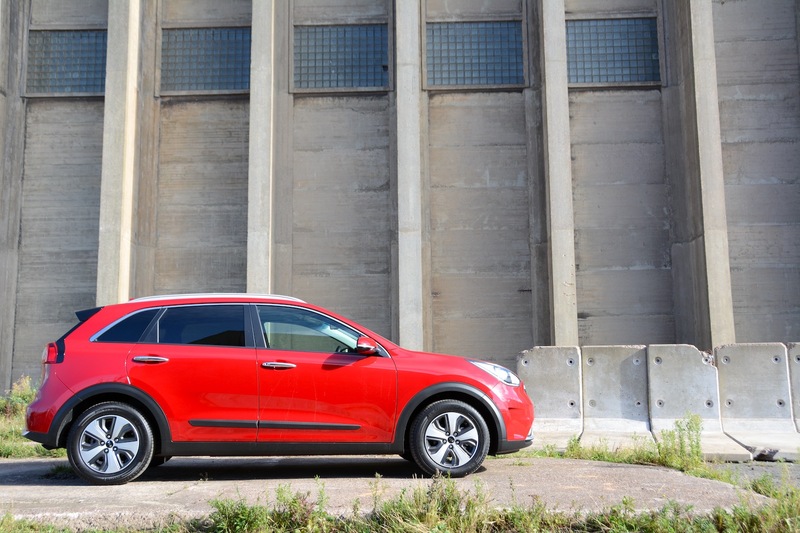 Even though there’s a hint of crossover about the styling, the Niro is purely a front-wheel drive car. Relative to the car’s compact exterior dimensions, it’s a practical size on the inside, with a decent-sized boot. For people who don’t like cleaning wheels, the silver alloys have dark grey inserts, meaning that the wheels can go much longer without a wash before they look dirty. 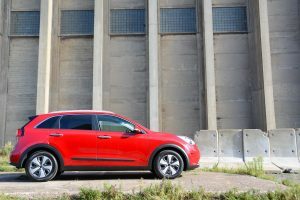 However compared to most crossovers and SUVs that seemingly have at least 20-inch alloys these days, although the 16-inch wheels on the Niro are good for keeping emissions low, they look a bit on the small side. 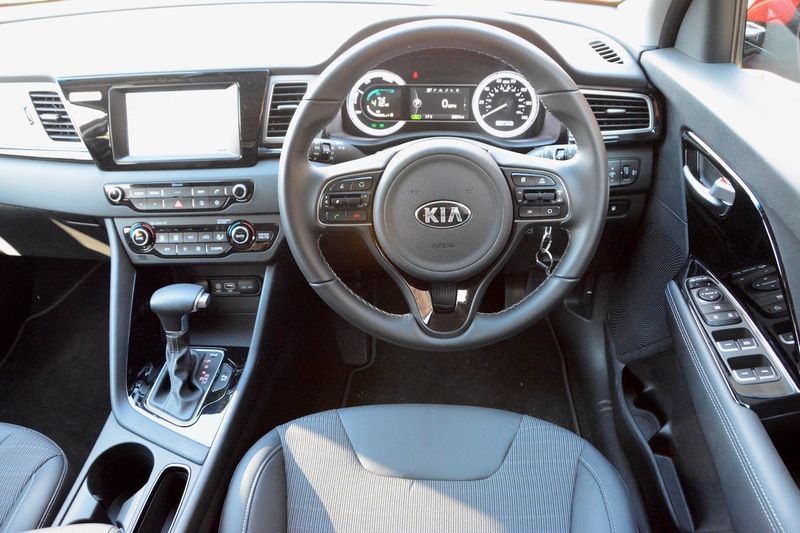 As with all Kias, the dashboard is simple, easy to use and inoffensive. The satnav is particularly clear, but there’s no rev counter; instead the left-hand dial provides a display showing if you’re in the zones of Charge, Eco or Power. First things first, the Niro has a decent driving position. And overall the car feels easy and light to drive. Combined with the fact that it is reasonably efficient and relatively affordable, as well as a practical shape, this is likely to be enough to make it an attractive buying proposition for many people. Like most ‘non-plug-in’ hybrids, the Niro will mostly run on electric power (when it can emit a noticeable whine) only at very low loads and for very short distances. If you accelerate harshly the car will switch to petrol power, and you’ll hear the engine cut in very clearly. The fact that the Niro has a ‘conventional’ 6-speed automatic DCT gearbox rather than a CVT is a further point in its favour. This reduces the revvy sensation that is all too often present in Toyota CVT hybrids under acceleration. You can change gear manually with the gear selector, although there are no steering wheel-mounted paddles. You can also move the gear selector to the right to select Sport. Unlike many cars with a Sport setting, there’s actually a noticeable difference between Drive and Sport in the Niro; Sport keeps the revs higher and makes the car more responsive. Moving the gear selector to the right is also a quicker, more practical solution than having to find a Sport button somewhere on the dash or in a touchscreen menu. However you’re left with the feeling that maybe a middle setting is also needed, one that’s more responsive than Drive, but that doesn’t keep the revs as high as the Sport setting. 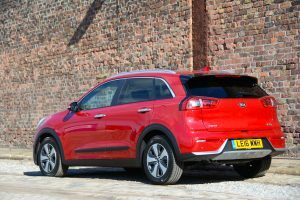 To extract a decent response from the Niro you do need to select Sport, as there’s really not that much performance on offer in Drive. And this is possibly the biggest downside with the Niro; although it may appeal to drivers who are happy with an efficiency focus, if you want a respectable level of power, and mid-range torque for accelerating, then you’ll have to look elsewhere. The traction control can also cut in harshly if you’re needing to nip quickly into a gap in busy traffic, when power can be cut in a very undesirable way. The brakes also take a bit of getting used to. The braking systems of many hybrids often don’t have a progressive feel because they’re capturing energy as well as braking, and this is certainly true of the Niro. 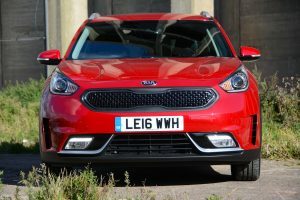 If you apply the same force to the Niro’s brake pedal with your foot as you would with a conventional car, you won’t be reassured with the resulting braking response. 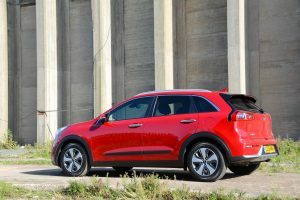 The Niro has a comfortable ride on most road surfaces; only when you hit very poor surfaces are you aware that this is a car with less cushioning in the suspension department than some higher-priced crossovers. The Niro’s handling is probably sufficient for 99% of people who will buy this car; we can’t imagine many people taking it to a track day to push it beyond its limits. It’s worth noting that thanks to more bodywork, the Niro is around 100kg heavier than its sister car, the Hyundai Ioniq Hybrid. This has an impact on performance, economy, handling and ride. It’s also worth noting that although the Niro has crossover-themed styling, the front overhang is relatively low. Don’t expect to be able to park with the front end of the car extending over high kerbs as you can in many crossovers, without hearing a grinding noise (we’re obviously not speaking from experience…). The official NEDC combined fuel economy figure for the Kia Niro is 74.3mpg, equating to 88g/km CO2 emissions. Our average over a week of mixed driving, with our standard split of around 80% long journeys and 20% around town – a combination which isn’t great for a petrol-electric hybrid – was 52.8mpg. As always, this is a fair way down from 74.3mpg. However if you drive a hybrid carefully you’ll stand a much better chance of enjoying economy closer to the official figures. 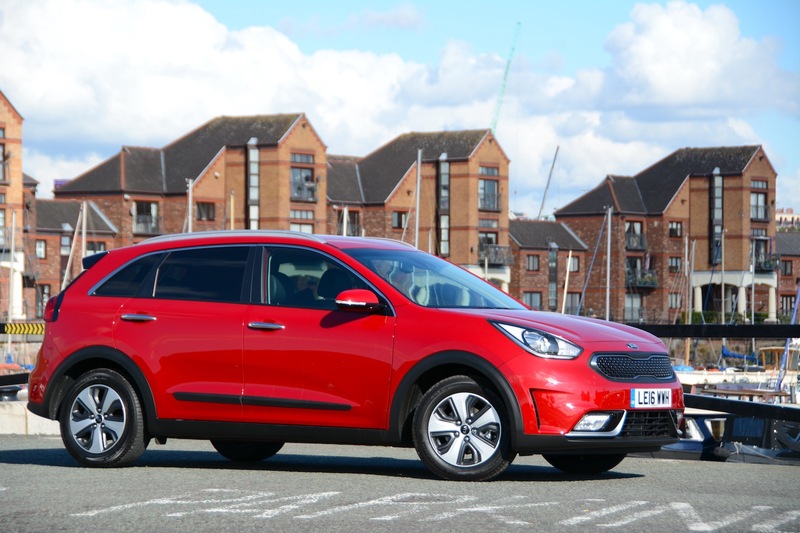 Although a diesel may be more economical over longer distances, the Niro promises lower levels of emissions that impact upon local air quality than a diesel. 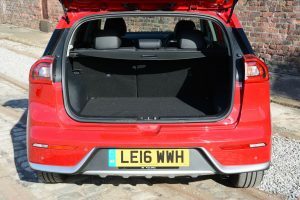 The Niro offered a decent driving range, despite only having a 45-litre fuel tank. 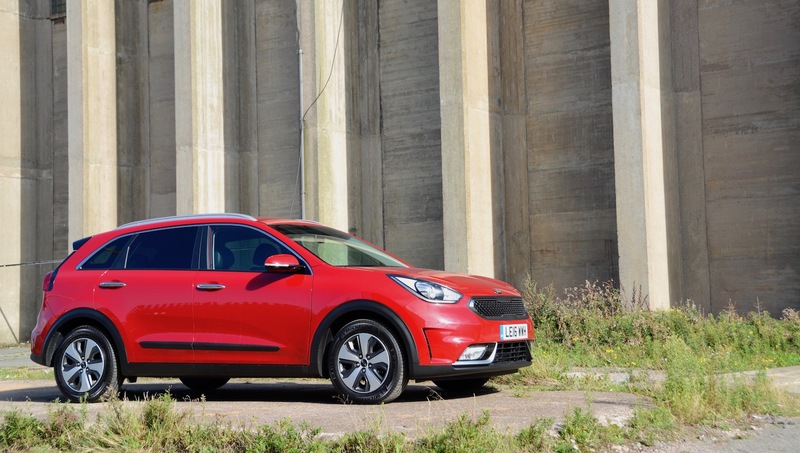 The Niro has one powertrain choice: petrol-electric hybrid. There are three trim levels: 1, 2 or 3, with prices starting at £21,295 and rising to £26,995. Our test car, a Niro 1.6 GDi Petrol ‘2’, cost £22,795. The Niro comes with a 7 year, 100,000 mile warranty. Toyota has dominated the market for petrol-electric hybrids for many years, so a new addition for the consumer is welcome. The Niro is ideal for people who want an affordable, efficient, easy-to-drive car, in a practical yet compact package. If you’re also looking for performance then the Niro probably isn’t for you. But as a first attempt at a hybrid that has appeal for a certain segment of the motoring population, the Niro is a good effort. It gains a Green Car Guide rating of 7 out of 10.